Mr. Sushil Shrestha and Mr. Jae Min Kim published a paper entitled "Bridging the Gap between E-Learning and Knowledge Management (KM): An enhancement of Moodle system by applying KM Functions "
Mr. Sushil Shrestha and Mr. Jae Min Kim published a paper entitled "Bridging the Gap between E-Learning and Knowledge Management (KM): An enhancement of Moodle system by applying KM Functions " on International Journal of Science and Technology. Mr. Shrestha is a faculty member at Department of Computer Science and Engineering and Mr. Kim, an E-Learning expert from KOICA, worked as an E-Learning Advisor in Kathmandu University. 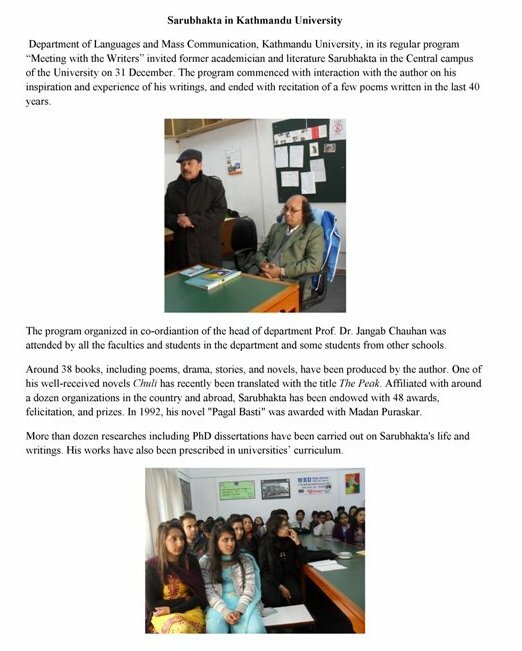 A special function organized by the School of Arts, KU at its new premises in Hattiban was jointly inaugurated by Founder Vice Chancellor Prof. Suresh Raj Sharma and Vice Chancellor Prof. Dr. Ram Kantha Makaju Shrestha on January 31, 2013. The program was attended by Controller of Examinations, Deans, Director of Student Affairs, faculty, administrative staff and members of the School of Arts. The function was chaired by Senior Professor Dr. Jangab Chauhan, HoD of Languages and Mass Communication. Prof. Mahesh Banskota, Dean of School of Arts, Prof. Dal Bahadur Adhikary, Chairman of National College, and Prof. Jangab Chauhan welcomed Prof. Suresh Raj Sharma, Madame Sharma, and Prof. Shrestha with bouquets. After the welcome speech by Prof. Banskota, each of the department of School of Arts presented different performances. The Centre for Arts and Design displayed paintings and presented gifts to Prof. Sharma, Madame Sharma and Prof. Shrestha. The Department of Development Studies organized the release of School of Arts Indicative Strategic Plan. The students recited a song and a poem while they also presented a gift to Madame Sharma. The Department of Languages and Mass Communications displayed a video. Mr. Hem raj Kafle sang a Nepali song. The Centre for Buddhist Studies presented Manjushri statue to Founder VC, and a book "Middle Way" (translation of Classic Buddhist) prepared by CBS Faculty to VC and a Shakyamuni Statue to the School of Arts. Artists from Department of Music sang the KU song with another special composition prepared by themselves. Technical Training Center at Kathmandu University is developing curriculum for Mechanical and Automobile training with the mission to “To fulfill the skill workforce in contest of modern advance technology”. The vision of the project is to make Technical workforce development and employment to meet the increase of rising generation in the project target area through support on the establishment of Technical Training center at Kathmandu University This project is running in cooperation with Korea International Cooperation Agency (KOICA). The project is looking for young and energetic Office Secretary as per following terms and conditions. 2. Assisting the Project manager to for proposal writing and preparing budget. 3. File handling and recording. 4. Conducting meetings, seminars and workshops. 5. Planning and implementing the programs through various work activities. 7. Coordinate with various groups of Experts in related field to arrange workshops along with the public, industries, and entrepreneurs. Female candidate will be given priority. Please send your application with motivation letter, copies of all credential, copy of citizenship along with two passport size photos to the following address by February 5, 2013. An interaction program is organised by Department of Civil and Geomatics Engineering; Geomatics Engineering program on January 30, 2013 at School of Engineering meeting room, Kathmnadu University to discuss on future collaboration with Open data for resilence Initiative (Open DRI) Nepal. Mr. Subash Ghimire, Assistant Professor and Co-ordinator of Geomatics Engineering program extended warm welcome to the Guests and participants and presented on the different activities of the Geomatics Engineering Program of Kathmandu University. Similarly, Mr. Shashish Maharjan, Lecturer of Geomatics Engineering Program presented on various open street mapping (OSM ) activities carried out by the program. Likewise, Dr. Nama Raj Budhathoki, Open DRI Nepal lead presented on different issues of Open street mapping and activities carried out by Open DRI Nepal. Mr. Ryan Sommerville, Regional co-ordinator, Open DRI south Asia and Mr. Robert Soden, Open DRI technical lead, The World Bank, Washington DC have expressesed their willingness to work together in this sector with the University. Mr. Janak Raj Joshi, co-ordinator of Geomatics Engineering Program, LMTC, Mr. Pankaj Dawadi, undergraduate program co-ordinator from Department of Computer Science and Engineering, Geomatics Engineering faculties from Kathmandu University Mr. Nawaraj Shrestha and Mr. Ganesh Dhakal, Mr. Lekhnath Dahal and Abhash Joshi, Instructors from LMTC actively participated in the interaction program. The interaction program has found out the following interconnected areas for potential collaboration. · Organising a Mapathon for international Open Data Day on February 2013. Mr. Subash Ghimire, Assistant Professor and Co-ordinator of Geomatics Engineering program also proposed vote of thanks to the guests and participants for their valuable time to discuss on various OSM issues. New Applications for Applied Research and Development (R&D) Project Funding Support from RenewableNepal Programme are invited from Nepalese Research Institution (University, College, and other organization qualifying as a research institution) in partnership with Nepalese Energy Industry, and preferably also in partnership with Norwegian/Foreign Research Institution and Norwegian/Foreign Energy Industry, to conduct Applied R&D for industrial development in Nepal in the area of Renewable Energy. The proposed project duration shall be of one year, planned for start from July/August 2013. RenewableNepal is a Programme for supporting research based industrial development in Nepal. It provides funding support to collaborative R&D projects related to renewable energy technology, planned and implemented by R&D institution in Nepal in cooperation with local industries and Norwegian/foreign institutions & industries. The Programme is jointly managed by Kathmandu University (KU), Nepal, and SINTEF Energy Research (SEfAS), Norway. It is funded by the Norwegian Agency for Development Cooperation (Norad). The programme is open for participation by all Nepalese and Norwegian/foreign Research Institutions and Industries on competitive equal opportunity basis within the Programme Framework. The Principal Applicant shall be a Nepalese Research Institution, which applies for funding support from the Programme to implement a conceived R&D project with the partners. The Principal Applicant and the Partners shall refer to Application Call Document, General Terms and Conditions, Application Forms & General Guidelines for preparing and submitting the application. These documents are available at http://www.ku.edu.np/renewablenepal for download or can be requested by e-mail to renewablenepal@ku.edu.np. In order to assist the application procedure, an Application Assistance Seminar will be organized at Kathmandu University, Dhulikhel, on 12 Feb 2013 (Tues, 10 AM). Please note that prior registration for the seminar is required. The participants shall have referred to the stated documents and preferably started preparing application. Please send e-mail for participation in the seminar by 09 Feb 2013. NOTE: The application preparation may require considerable time and coordination between the partners. Please refer to the documents and start preparation as soon as possible. Please contact the Programme office by e-mail for assistance. Videoconference took place between Dr. Mahavir Pun, Prof. Mahesh Banskota, Dr. Sagar Raj Sharma from Kathmandu Model Hospital Video Conferencing Center and MDEVS students of Kathmandu University who are on an internship field visit to Nangi VDC, Myagdi from Himanchal High School Video Conference Center, Nangi VDC, Myagdi. In the conference, students share and make queries related to field research experiences to Dr. Pun and Prof Baskota to strength their field visits. At the mean time, Faculty and PhD student of KUSOA also joined the session through newly installed videoconference center at KUSOA, HatiBhan that helps to share the resources and experience to the student in Magdi. Dr Mark Finn Senior, Lecturer and Dr. Paula Geldens (Co-Convenor) Consultant, Faculty of Life and Social Sciences with 22 students from Swinburne University of Technology, Australia visited KUSOA, Hattiban Complex, on January 22nd 2013 as part of their visit to Nepal programme. The main mission of the visit was to get experience with another culture from inside, focusing around the twin themes of cultural research and intercultural communication. After welcome session, Prof. Dr. Mahesh Banskota and Dr. Sagar R. Sharma, Dr. Uddhav Pyakurel and Ms. Prarthana Aryal, Dr. Uddav Payakurel gave presentation on Social Equity and Inclusion in Nepal. There was an extensive question-answer session after the presentation. Kathmandu University enhances its Video Conferencing Service. In addition to the Central Campus, Dhulikhel, the service has been established in School of Arts and Education, Hattiban, and School of Management, Balkumari too. Information System Management Section (ISMS) has successfully installed and tested it on 22 January, 2013. The service can be used by all the faculty members, students, researchers as well as staffs of the university in coordination with the ISMS. 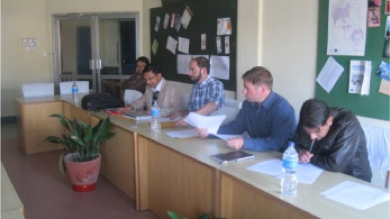 Prof. Norbert Bartel from the Department of Physics and Astronomy, York University, Toronto, Canada delivered a seminar on the topic “Testing Einstein's Universe” on 15th of Jan. 2013 at Kathmandu University. The seminar was followed by a film on the Gravity Probe B Mission which is written, directed, narrated and produced by Prof. Bartel. The program was organized by the Department of Natural Sciences, School of Science at the E-learning room in Prof. Inge Johansen Engineering Block, KU. It was attended by faculties and students of School of Science and Engineering. The seminar was also attended by the Registrar, Prof. Bhadraman Tuladhar, Dean of School of Science, Prof. Panna Thapa and the Controller of Examination, Prof. Pushpa Raj Adhikary. Dr. Deepak Prasad Subedi, Head of the Department of Natural Sciences, conducted the program. After the seminar, Prof. Bartel also visited the Plasma Physics laboratory at the department. After the visit of the department, Prof. Bartel was presented a Token of Love by Prof. Tuladhar at his office. Mr. Pranil Kumar Upadhayaya, PhD candidate at the Department of Development Studies, School of Arts, KU successfully defended his PhD thesis amidst the presence of various national and international scholars, academicians, researchers and students at the Hattiban Complex, KU on Jan 11, 2013. The title of the Thesis was Tourism Amidst Armed Conflict in Nepal: Consequences, Copings and Contribution to Peace-building, which was supervised by Dr. Bishnu Raj Upreti (from NCCR North South), Dr. Sagar Raj Sharma (from the Department of Development Studies, KU) and Dr. Laurent Goetschel (from Swiss Peace Foundation). This research is part of the ongoing collaboration between the NCCR North South and the Department of Development Studies, Kathmandu University. Among the present in the defense were Dr. Laurent Goetschel, Dr. Andrea Iff (Swiss Peace Foundation), Prof. Bhim Subedi (Tribhuvan University), Dr. Mahesh Banskota (Dean, SoA) and several other faculties, students and members from the private sector. Renewable Nepal Project PID-379 invites applications from interested graduates on monitoring activity of the biogas plant that is to be started as soon as possible. Please contact the project leader with your latest bio data. The Himalayan Cryosphere, Climate and Disaster Research Center (HiCCDRC), Dept. of Environmental Science and Engineering (DESE), School of Science, Kathmandu University (KU) has conducted a 5-days training on Glacio-hydrological Modeling under the Partnership for Enhanced Engagement in Research (PEER) Project entitled “Establishing a collaborative assessment of the impacts of climate change on the hydrological regime of the Langtang River Basin, central Nepal” funded by the United States Agency for International Development (USAID) through the National Science Foundation (NAS), USA from 18 -23 December 2012. The total numbers of training participants were 28. They were from different academic and government institutions such as graduate students of DESE, KU, Central Dept. of Hydrology and Meteorology, Tribhuvan University (TU); Central Dept. of Environmental Science, TU; College of Applies Sciences-Nepal, GoldenGate International College; and staffs from the Dept. of Hydrology and Meteorology (DHM), Government of Nepal. 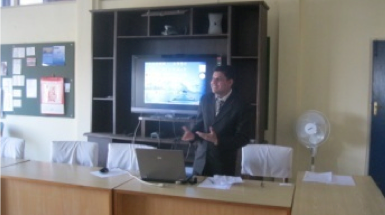 According to the Coordinator of HiCCDRC and Principal Investigator of the project, Dr. Rijan Bhakta Kayastha, the training program was a part of capacity building component of the project aiming to give theoretical as well as practical knowledge of glacio-hydrological modeling to young graduate students and researchers. Apart from the Collection, Preservation of Information resources is another important function of the library. So, KUCL has installed 16 CCTVs in different corners of the library to prevent the resources through, so called, malpractice. This is one of the great achievements in the field of library systems in KU. The library automation which we have started in 2005 is now going to be switched in newer version, i.e., an updated version of SOUL1 to SOUL2 in near future which has many more facilities of library operations.